I recently wrote about what I called fully asymmetric board games. Fully asymmetric games can be great fun, but design challenges abound. A vast amount of playtesting needs to be done to balance the factions; otherwise you end up with a game that’s “solved” pretty quickly by playing one particular faction. Games with limited asymmetry are much more common — I like to call this “strategic asymmetry” because the choice of faction or initial player setup tends to direct the player’s strategies in particular directions. One interesting example comes in the latest hotness, Terraforming Mars. This game gives you the option of starting on a completely equal playing field with what the game calls “Beginner Corporations”. Each player using a beginner corporation starts the game with 42 megacredits… and that’s it. However, the real meat lies with the standard and corporate era corporation cards. I’ve shown a pair of standard corporation cards on the left. Note that each begins with different levels of cash (megacredits) plus different starting abilities. Ecoline begins the game with one extra plant source income plus three plant sources. In addition, Ecoline only requires 7 plant sources to generate a plant tile, which the player owns. Helion begins with three heat production plus 42 megacredits. Helion can also use heat as cash equivalents, which can be a pretty powerful ability. In effect, Helion begins the game with four corporate income per round (called a “generation”), which can be used as cash. (All corporations get megacredit income based on their terraforming rating — victory points — plus corporate income). At the start of the game, players buy cards from an initial draft of ten cards (per player); an additional four-card draft takes place at the beginning of the round. 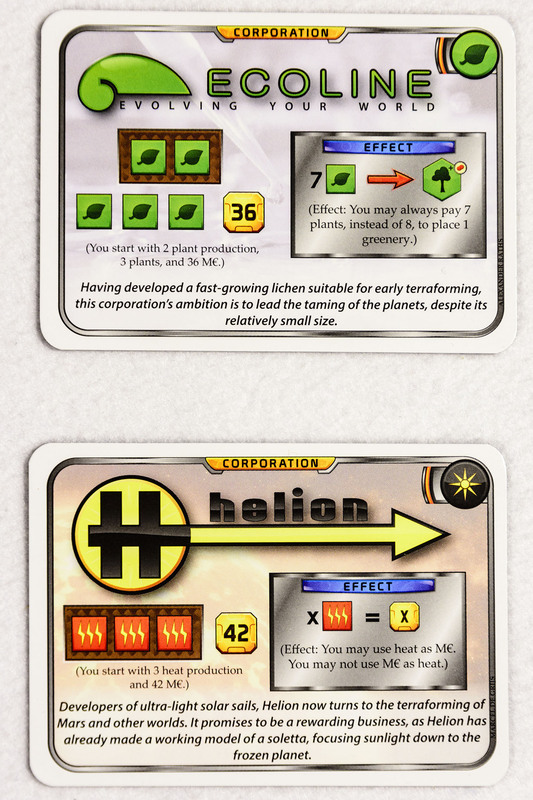 An Ecoline player would almost certainly focus on acquiring plant-based cards while Helios would want cards which help them generate more heat. On the other hand, one of the mechanisms to advance the game is pushing up the average temperature of the planet. This takes heat, but Helios may be disincentivized from pushing heat up and use their heat production as money instead. Needless to say, these difference in starting faction, plus the cards the player drafts, have an immense impact on the strategy a player pursues throughout the game. You can find a simpler version of strategic asymmetry in the fast-playing and highly popular 7 Wonders. 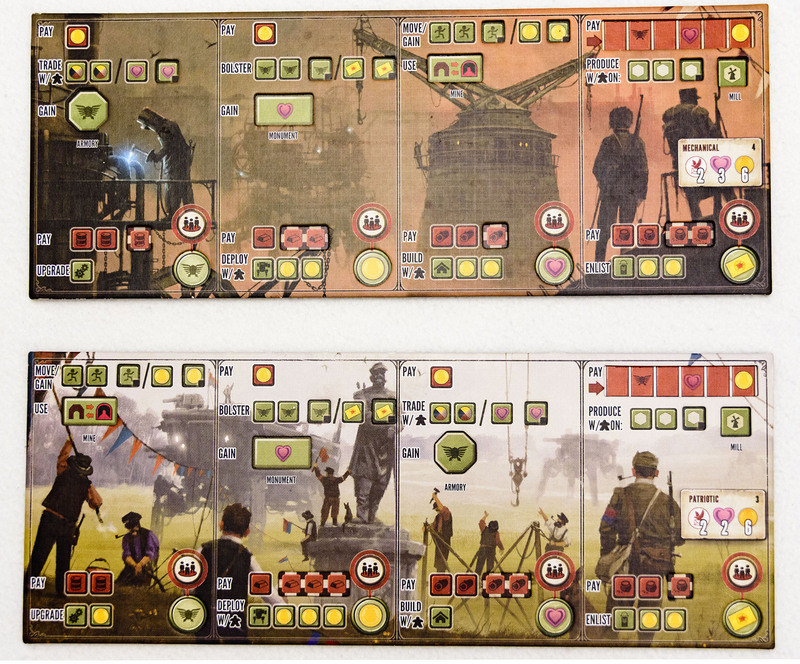 Each player gets a different player board, and each board offers a different selection of Wonders which can be built. The game offers a number of paths to victory, including the wonders built on the player’s mat. However, the nature of the wonders tend to shape how the players draft their cards, and what strategies they pursue. 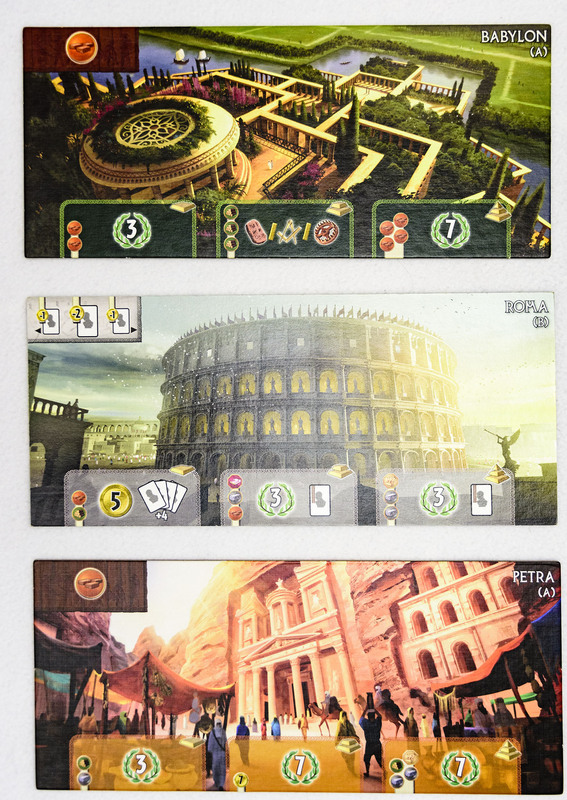 Since 7 Wonders does give players a number of different ways to win, the wonders on the player mats don’t give a player as strong an incentive to pursue a particular strategy. In fact, depending on how the card draft goes, a player may pursue a strategy completely counter to the one implied by the wonder selection on the player board. So consider the 7 Wonders approach to strategic asymmetry a nudge, as opposed to Terraforming Mars, where pursuing a contra strategy can severely limit the player’s ability to compete. Somewhere in-between the clearly delineated strategy of Terraforming Mars and the light nudge inherent in 7 Wonders lies the game Scythe. Scythe approaches strategic asymmetry in a uniquely flexible way. Each player has a faction mat and a separate player mat. The faction mat nudges the player towards a particular strategy arc, while the player mat suggests the tactical approach a player would take in each turn. For example, the Nordic Kingdoms faction gives the players the ability to move workers across rivers, enabling more efficient resource collection. Factions also determine initial combat power and the number of combat cards drawn at the start, which affects martial abilities. differ, and the main action-optional action pair in a space differs for the different player mats. What’s really cool, however, is that assigning player mats and factions is random. 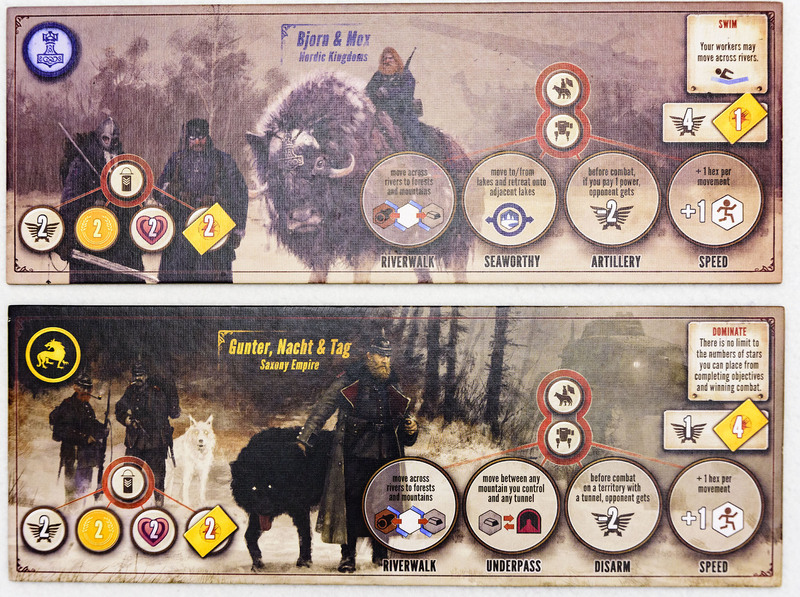 The combination of player mat and faction means the individual strategic approach differs from one game to the next. It’s a pretty cool implementation and seems to be well-balanced to boot. I tend to prefer strategic asymmetry to a fully asymmetric game, since the base game rules remain the same for all players. It can be difficult to understand other players’ strategies in a game like Vast: the Crystal Caverns unless you understand all the different rule sets for all the players. However, my preference isn’t a strong one, and I like playing a game that offers some level of asymmetry rather than one where everyone starts off just the same.